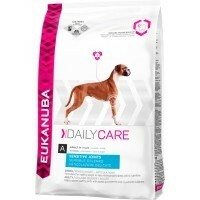 Eukanuba Daily Care Adult Dog Sensitive Joints 12.5Kg Dry. The ability to move around freely is a sign of good health – but for many dogs, sensitive joints and excess weight can reduce the activities that make them dogs. In fact, joint disorders are the number one health issue among large breed dogs. Natural fish oils - To help support healthy joints. Natural Cartilage Nutrients - For flexible joints. Essential vitamins and minerals - To help your dog stay alert and active. Low calories - For proper weight management. Keep feeding this carefully designed nutrition to make sure your dog is getting all the care he needs especially with breeds that are prone to joint sensitivities. Maintain the diet that agrees with your dog! There are no artificial flavourings, preservatives, colourants or fillers added into this diet.